As of the end of March, the Federal Elections Commission data base before, from zip code 10454 (Port Morris and Mott Haven, up to 146th Street) a total of 10 federal campaign contributions, in the previous year. All of the contributions from this zip code, which, according to the last Census, has 35,994 residents, and a median family income of $10,865 -- were from businesses. Businessman Murray Feiss, who has received extensive City subsidies in the past decade, contributed $300 to the National Republican Congressional Committee in September, 1999. Andy Wist of Standard Construction gave $1,000 to the Congressional campaign of Brooklyn's Noach Dear. And Howard Stein of Rite Check Cashing gave $1,000 to the National Check Cashers Association Political Action Committee. Continuing in the South Bronx: zip code 10455, Mott Haven, made 11 federal campaign contributions in the past year, five of them from one John Villanueva, all to "Friends of Giuliani Exploratory Committee." A Raul Rodriguez gave $500 to the National Republic Senatorial Committee; Carmen Arroyo gave $250 to Gore 2000, Inc.
Zip code 10457, East Tremont, listed 6 contributions -- all to Republicans, except for Solomon Berger's $1,000 to "Lautenberg 2000 Committee," in April 1999. Lautenberg has been a New Jersey Senator. He's no longer running; the contribution has been refunded. So, make it FIVE contributions, from this zip code -- ALL to Republicans. Zip code 10452, the West Bronx from 161st Street to Featherbed Lane, listed only two federal campaign contributions: one to North Bronx Congressman Elliot Engel, the other to the Textile Rental Services Association PAC. 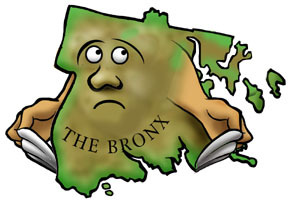 Zip code 10451, the West Bronx up to 161st Street, made 13 contributions, mostly from businesses. Robert Cummins of Guardsman Elevator played both sides: in March 1999, $1,000 to Gore 2000, Inc.; in December 1999, $1,000 to Bush for President, Inc.. Is that a hedge bet, or a change of heart in the course of nine months? Steve Bacher of the Children's Aid Society gave $250 to Bill Bradley for President, Inc., as did Karen Courtney of the Citizens Advice Bureau. Murray Lewinter gave $1,000 to Bush for President, in November 1999. Zip code 10456, Morrisania, listed only two contributions, one from Assemblywoman Gloria Davis in October 1999, to Hillary Rodham Clinton's campaign. Zip code 10459, Longwood, made only one federal campaign contribution, in March 1999, to a painters union PAC. Zip code 10460, West Farms, made 8 contributions - seven of them from Peter Duffy, each of them to Pat Buchanon. Hannie Santana gave $250 to Bush for President, Inc. -- making it a Republican sweep of West Farms. Above 183rd Street, zip code 10458 gave 17 contributions (posted through March 31, 1999) -- 12 of them from Albanian activist Harry Bajraktari, who met with President Clinton in April 1999. Gjon Chota of this zip code gave $1,000 to Trent Lott for Mississippi. Zip code 10468, Kingsbridge, gave six contributions. Stephen Jerome of Monroe College that $1,000 each to Congressmen Engel and Serrano. Zip code 10474, Hunts Point, was more active, with 14 contributions, all from businesses. Robert Schratzmeier of Hudson Sheetmetal went Republican (National Committee); Leon Eastmond went Democratic (Congressional Campaign Committee). The Cattlemen's and the Sheetmetal Contractors' PACs also got contributions from Hunts Point. In perhaps the hypest comparison, zip code 10472 (Soundview, location of the killings of Messrs. Diallo and Ferguson) gave five federal campaign contributions: one to Bradley, one to Hillary Rodham Clinton, and two to Republican Congressional race funds.